Image courtesy of Kyle Books. As Angie writes in her introduction, this is not a diet book! Instead she is thrilled to share her personal passion about clean and healthy living with the Latin community. Despite its bold flavors and fresh ingredients, Latin cuisine has never exactly been known as “light.” Once Angie and Angelo combined forces, they knew they could share a balance of the old and the new in dishes like Shrimp and Papaya Ceviche and Silken Soymilk Flan, or beverages such as the No-Guilt Mojito, alongside deep-rooted family recipes like Angie’s grandmother’s Crispy Tostones and Angelo’s tía Carmen’s Dominican Fish Stew. There’s something for everyone in this beautifully photographed cookbook, whether you’re vegetarian, vegan, gluten free or an omnivore looking for lighter fare. 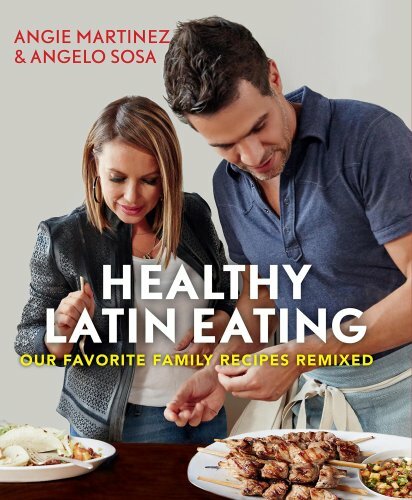 In the first chapter, Angelo’s Healthy Kitchen, you’ll read about smart ingredient substitutions, alternative cooking methods, and subtle reductions in sugar, fat and sodium that create healthier food without compromising the integrity of Latin cuisine’s celebrated, iconic tastes. These simple yet flavorful recipes are for any level of experienced cook, with helpful notes ranging from kitchen prep tips to nutritional advice to ingredient tidbits.